Retro Drive has announced an exclusive version of its upcoming Blood Drive series for the Philly Show. Only 50 collector’s box set editions of the Philly show variant, Blood Drive: The Parody Collection Vintage Style Trading Card will be available at a cost of $35.00 per set. Blood Drive: The Parody Collection is an upcoming series which will explore pop culture through the adventures of a genetically engineered bat named Radar. He lovingly lampoons some of the most popular comic book, gaming, film and television franchises from the last fifty years while celebrating the fandom that has made it all so popular and long lasting. Each Vintage Style Trading Card Collector’s Box Set will contain a complete set of 63 vintage style base cards printed on chipboard just like the trading cards in the 80s and one sticker card. 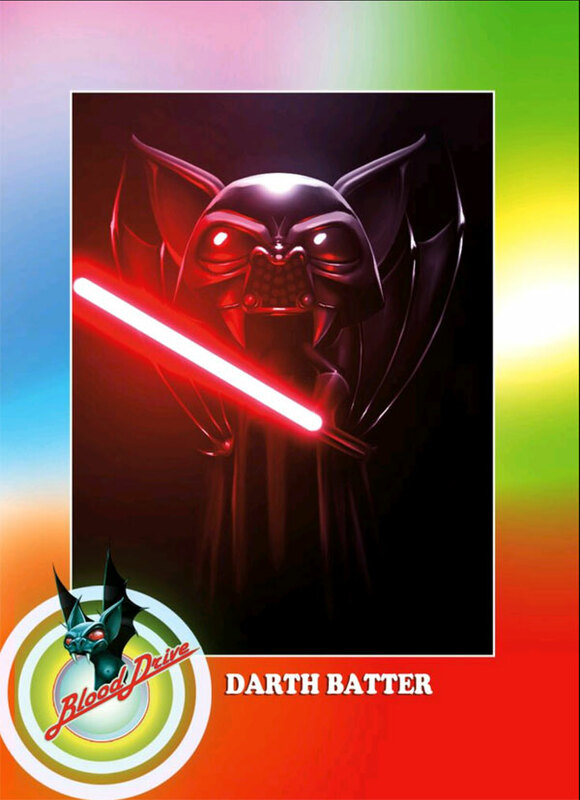 The Philly Non-Sports Card Show Variant Box edition contains a “Darth Batter” metal card not available anywhere else! The standard edition contains one random metal card from Retro Drive’s four different metal card creations. For those who are unable to attend the show or who would like to learn more, visit Retro Drive’s ongoing Kickstarter for more details. Please consider pledging if you like their very creative series.